After reading a lot comment on Version 1.2.5. and after the announcement of Visual Studio 2017, we decide to update the entire package. ESP8266 Wizard and Compiler tools for Visual Studio. Develop ESP Firmware on Windows come easier. Error List with line number inside output windows during build. Setup detect older version and uninstall VSIX properly. Fix Release/Version default value was taken form wizard dialog interface. COM Port string was replaced by a combo-list. COM Speed string was replaced by a combo-list. EspTool Reset option combo-list was now added. Place port and speed at begin of ESP_Tool. Reactive Intellisense inside VCX Project. Adding additional define in Xtensa C/C++ Menu. Installation can be placed everywhere. Now, you can use on multi version of visual studio at the same time. 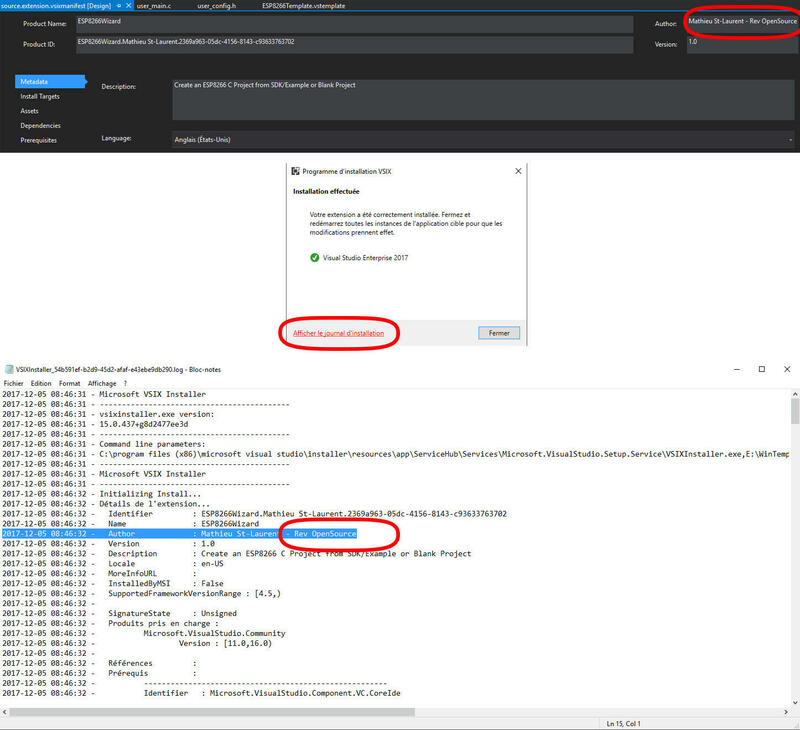 Setup was depend now to one variable : "InstallLocation". This one was placed into the registry during the installation. For the moment any Diagnostic tools was created for this version. P.S. See some bug or need improvement, just reply me! After some comment, I decide to let go ESP8266 Wizard to Open Source. Feel free to modify, but it's gonna be under some rules. Before, let's understand the esp8266 Wizard. Actually, if you handle well the concept, XTENSA folder can be recompiled inside a DLL, to convert targets command line based to DLL function. That's mean, this way was multi-project secure. You can have with another Microsoft project inside same solution. 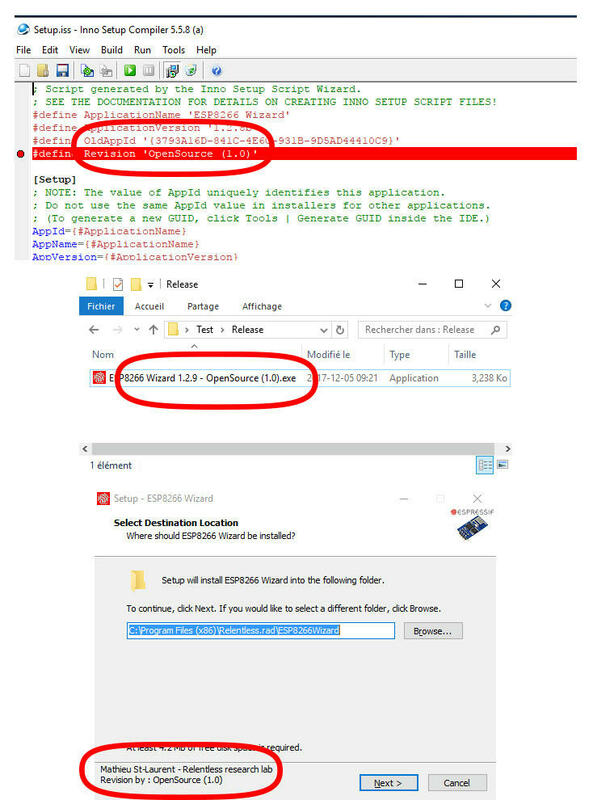 Take care to have unique name for every target, don't attempt to override "Build" target or something used by Microsoft. 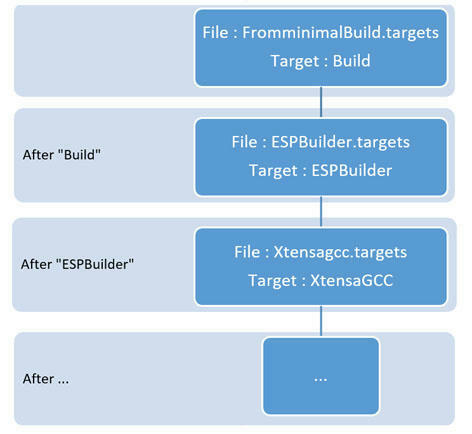 Also, by include FromminimalBuild.target you can create another builder like example "an Atmel compiler". 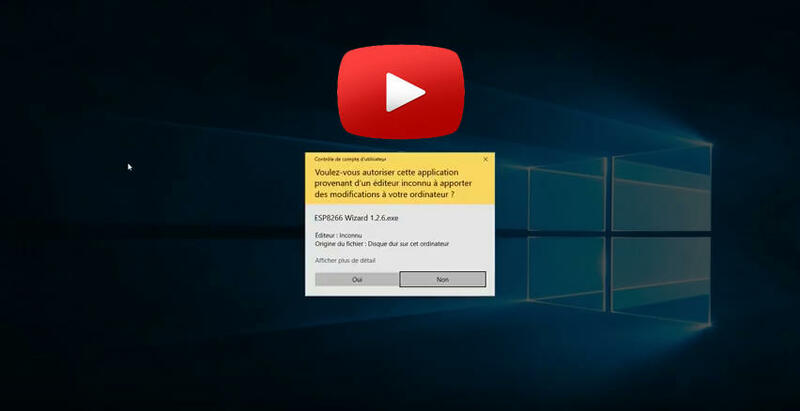 If you modify the package on windows 10, be sure that you don't install on same partition that Window 10. The new right of C: Partition, made in sort, that you must start your visual studio 2017 in administration mode. That's a little annoying. If you create a new SDK package. Try to keep in philosophy, that you need two sub-folder to keep compatibility with other project. Put your paw and fill logbook... see below. If you modify the VSIX, don't forget to replace the .VSIX file from Release folder to Installation folder. When ready to repackage, start CopySources.bat script. Because XML, PROPS and Targets can't be really compatible with Git or something similar. I mean, you can't keep trace of modification or branch. I ask you to put your paw at specific place to see which package you really install. Like this, we gonna be enable to see which part used during installation and we gonna be in mesure to offer support with specific version name. Replace OpenSource by your name and change also the version. Change one place and the rest is automatic. Modify the Logbook.txt to include date, package name, coder name and description of update item. Last edited by Fleuve on Fri Nov 09, 2018 12:12 am, edited 9 times in total. You totally right with the bug. This one check Chip id before programming, that's means if the chips was not detect, this one gonna skip the programming stage. I must admit, that i really take the thing brief with esp_tool. In 1 or 2 day, it's gonna be updated. The entire package contain 3 Flash tool, i need to extract the proper one. After that it's gonna be easier to integrate. 1>C:\Program Files (x86)\Relentless.rad\ESP8266Wizard\MSBuildTemplate\ESPbuilder.targets(133,5): error MSB3073: uscita dal comando "esp_tool -of -rNodeMCU -b128000 -pCOM3 > "C:\Users\raffa\Desktop\EspWS2812\EspWS2812\ConsoleOutput.dbg"" con codice 1. 1>Compilazione progetto "EspWS2812.vcxproj" NON COMPLETATA. I'm gonna fix it in 1.2.8 - Thanks! I find esptool py version on GitHub, but i hate python. Also I've find NodeMCU Flasher Pascal version on GitHub. Maybe if i install delphi, i can modify it to fit in command line mode with output display and -nogui flag or something like that. But for the moment i working to program an Atmega1284p with Chinese isp key, it's for this reason that didn't test ESP programming (need to reinstall my ESP on my protoboard). Today is my day off, then 1.2.8 gonna be fixed tomorrow. This tool is incredible you made a great work, as a suggestion, is there any chance to add the MESH_DEMO to the supported SDKs and examples? lele wrote: This tool is almost perfect! Just missing debugger, do you plan to integrate serial gdbstub? The entire process is actually a test that I made, because Visual Studio 2015 & 2107 Plugins have change a lot. I just decide to apply on ESP8266 to make concrete test. I have a lot to relearn before the entire process gonna be more professional. There is the main Visual Studio plan. DirectX GUI interface compatible with PC/Surface Pro and Surface (ARM). Now where i'm in this hell plan? Support all Input: Mouse, keyboard, XBox game-pad, Gesture. Support picture : png, bmp, jpg. Support Video : avi, mp4, mkv. Atmel Atmega : Not started. ESP8266 : Near Final, but still need update. Now for the serial debugger, I've see some information about this : https://github.com/espressif/esp-gdbstub. The concept, seem to be simple. You look, more grounded on ESP that me. Then if you know more and ready to make a test (update package, config Project and a simple test with xtensa-lx106-elf-gdb in command prompt), it can be handful.